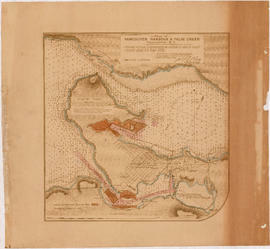 Item is a map showing major landmarks, railway lines, harbour lands reclaimed, proposed wharves and piers, retaining walls and dredging, and soundings in fathoms in Vancouver Harbour (Burrard Inlet) and False Creek. Item is a brochure promoting Vancouver harbour as a hub of economic activity in the city. The brochure includes illustrations of harbour activity, facts about various aspects of the operations to show the harbour's capacity and facilities. Part contains information about the survey data upon which the charts are based, and contact information for the Canadian Hydrographic Service. Item is a booklet containing twelve charts showing tidal currents in Vancouver Harbour at different points in the tidal cycle. Part contains explanatory text to be used in conjunction with the tidal current charts in the booklet. 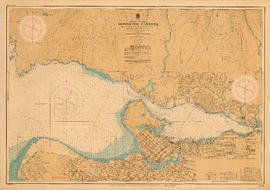 Item is a nautical chart of Burrard Inlet and Vancouver Harbour from Point Grey in the west to Second Narrows in the east, showing soundings in fathoms, tidal information, anchorages, beacons, and waterfront businesses. 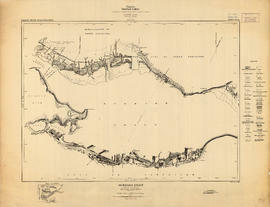 Vancouver Harbour : plan of south shore, Burrard Inlet between Heatley Ave. and Victoria Dr. Item is a map which shows parcels of land along Burrard Inlet and district lots in downtown Vancouver. Piers, factories and mills along the waterfront are identified. Soundings are shown in feet. Item contains both nautical chart and map data. Nautical chart data includes soundings, anchorages, ferry lines, wharves, and waterfront businesses. Map features include district lots, streets, railways, and municipal boundaries.